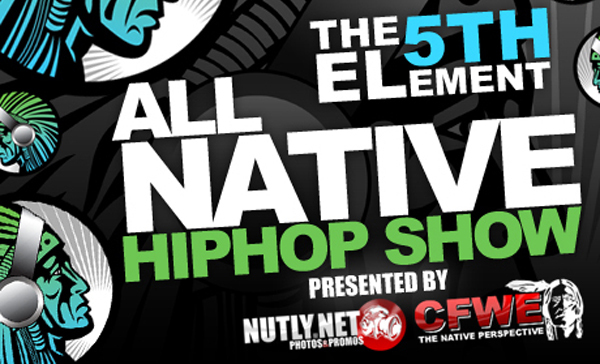 Brad Crowfoot over at Nutly.net has compiled his annual all-Native hip-hop show for CFWE Radio in Edmonton. This year's show features an amazing lineup of Indigenous talent from across Canada. Kasp ft Nightshield, Rayne & Crown P – "Real" Blu ft Jon-C & Okema – "Built for This" H-Town, G-Shotta & S.I.D – "Money In Dis Game"
Manik – "Hood Miracle" LP – "Running Bars" Blazin Natives – "Movie Star" Drezus – "Better Off"
Wab Kinew ft Lorenzo – "Sunshine in my Pocket" Won18 – "Higher" Winnipeg’s Most – "Take It Over the Line" Feenix ft Will Belcourt – "Countdown to Showtime"
OsTwelve – "Get Up and Go" Hellnback – "Tick Tick" Julez Lavish ft Anasaz – "Changing the Game"
Tru Rez ft Adion – "World is Yours"